Sports turf can be used to cover high school football fields, large soccer complexes, and even golf courses. While a game can’t always be perfect, the turf always can. What some might just see as grass, any athlete knows differently that it can help to make or break the game. Proper upkeep for sports turf can immensely change the game. 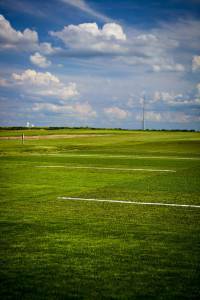 So you want to have a beautiful playing field with yards and yards of lush green sports turf. However, it isn’t necessarily that easy and turf carries it’s own list of duties for upkeep. But what are those things? If you are new to the sports turf world, you might wonder what could possibly be worried about when it comes to sports turf – it just gets installed and sits there right? Wrong. Sports turf can last for a long time if it is properly managed and well taken care of. Here, we will list just some of the many things that one should be concerned about when they have sports turf installed on playing fields. Do you know anything about soil compaction or grade in heavy traffic areas? How about aeration schedules, nitrogen application plans, or standing water? Some seasons can make your turf too spongy while others have the ability to dry it out completely. Some turf needs rest after it has been overused in events such as tournaments, and certain years others might need to be overseeded. Colors can change and even the feel can change. Sometimes turf is supposed to look and feel certain ways, and sometimes it isn’t. These are all concerns that you probably don’t want to be constantly worrying about. Why try to figure out all of these things on your own? It’s not enough to pay somebody to install your turf and then watch the company leave. Use a professional company that is committed to proper maintenance and knows what they are doing. It will save many headaches and give you the piece of mind that your investment is being used to the best of its ability. If you want to learn more you can visit sportsturfonline.org or give Commonwealth Sports Turf Services a call today! https://cwsportsturf.com/wp-content/uploads/2016/08/bigstock-High-overhead-angle-view-of-go-65229289.jpg 682 1024 Keith Kitchen https://cwsportsturf.com/wp-content/uploads/2013/04/CWLogo-trimmed-F003-cd1.jpg Keith Kitchen2016-08-27 00:59:262019-04-03 11:15:55What is Proper Upkeep For Sports Turf?